I have a love-hate relationship with earbuds. I love the lightness and ease of simply slipping them on, as opposed to fitting bulky headphones over my head and (in the case of sports models), tucking the wire behind my ears. I hate the fact that my ears seem to be difficult to fit, with most earbuds jumping out as soon as my head moves. Unfortunately, these very capable-sounding earbuds are just not made for me. I spent a very long time experimenting with different positions, angles and settings, changing the tips and studying the photo. If there is a trick to getting them to stay put, it doesn't work for me. I simply can't get them to stay in my ears! It's a shame because the specs are terrific and when I accept a product for review, as I did with this headset, I like to put it through its paces and give it a proper road testing. But, faced with the inability to keep the headset on my head, I feel unable to comment meaningfully on the operational aspects and certainly on the sound quality. So all I can do is describe the product briefly. It comes very nicely packaged in a small hard shell case with a zip closure. 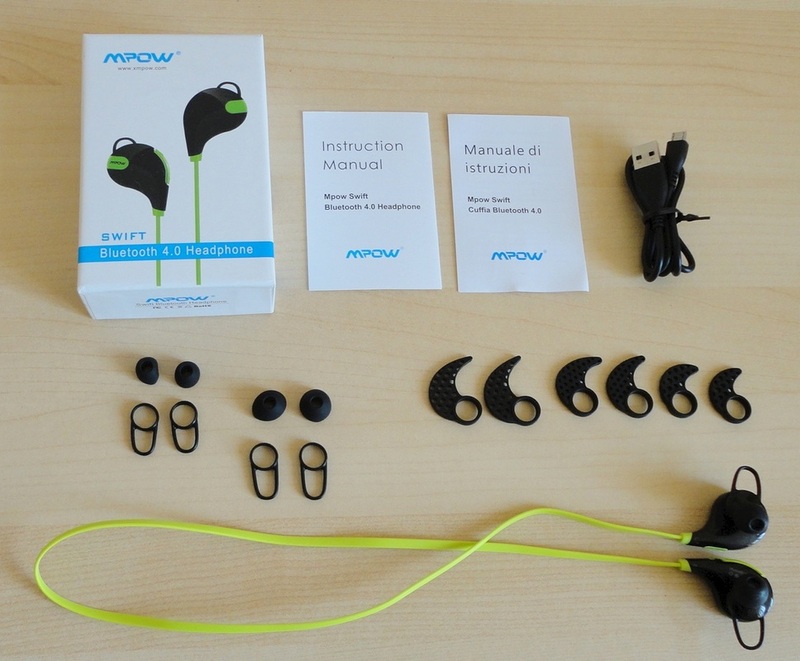 Inside is the headset, a succinct manual in English, 3 extra sets of tips (giving you 4 choices in all), and a non-standard micro USB charging cable. I did notice, as others have, that the micro connector is longer than usual. This is not an issue as long as you don't lose the original cable, but it could be annoying if you do misplace it, as all your standard micro USB cables will not reach deeply enough to make a good connection for charging the twin batteries. And this is the big extra that makes this headset stand out from the crowd. It has two batteries, giving an amazing total autonomy of 12 hours. As with similar headsets, there is a tiny integrated microphone for hands-free telephone conversations. 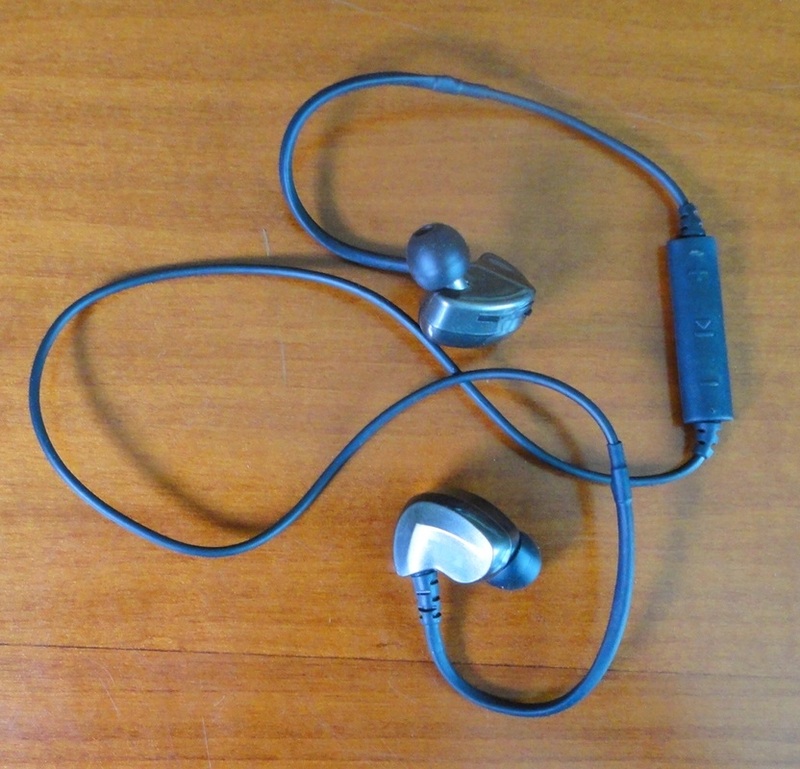 Unlike other earbuds, the commands are on a sleeve, located a few inches below the right earbud and joining the main wire to the right portion. I'm not an expert but this seems to me to be asking for trouble, introducing a potential break point along the wire. Also the positioning of the buttons on a movable portion of the cable (basically dangling close to your face) seems to me less than ideal. I'm used to commands set on the right earbud, where a little resistance makes operating these tiny buttons a bit easier. However, since I was unable to properly test this headset, this is simply an idle observation not backed up by experience. I see that this headset has been well enough received, so my conclusion is that, if you can wear it comfortably and stably, then you can take advantage of its many state-of-the-art features. As for me, we really didn't get along. I have a love-hate relationship with earbuds. I love the lightness and ease of simply slipping them on, as opposed to fitting bulky headphones over my head and (in the case of sports models), tucking the wire behind my ears. I hate the fact that my ears seem to be difficult to fit, with most earbuds jumping out as soon as my head moves. The Bluetooth connectivity, which allows me to listen to music from a variety of sources, depending on what I'm doing. I can use them in combination with a DVD Player when I'm doing cardio, so that watching a video makes the repetitive exercises less tedious. I can pair them with my laptop or pc when I want the widest choice of music. With the help of a Transmitter, they stream sound from my vinyl player to give me access to vintage LPs. Or I can simply connect to a tablet or my Kindle if I'm not home. The fit. 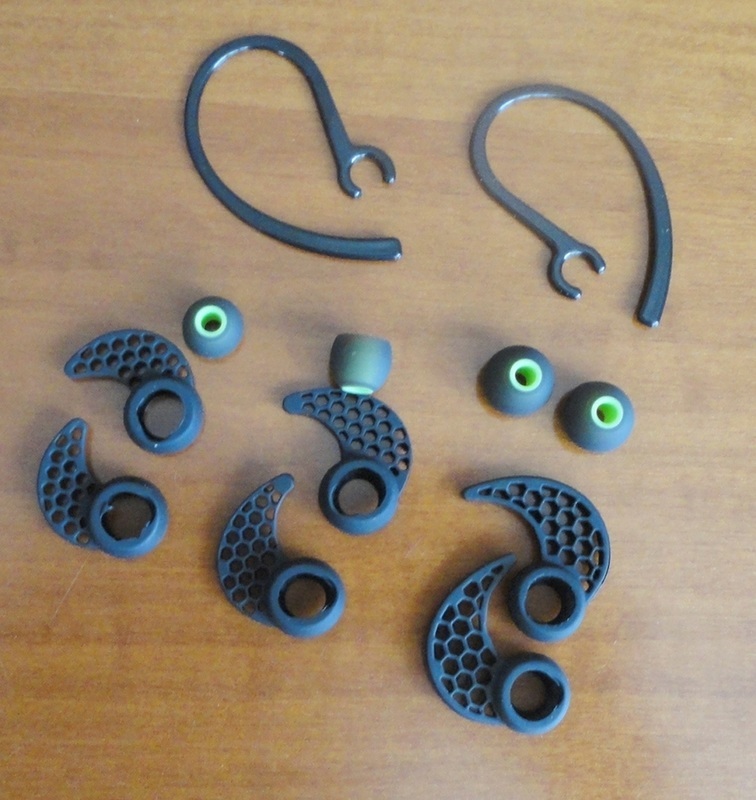 I took the time to experiment with the unusually large range of fittings but, in the end, what works for me is the medium set of ear tips with the plain stabilizers. The “wings” don't seem to engage properly in my ears. However, the fit is excellent, with a suction effect that I had not experienced before. Outside noise cancellation is total, once the ear tips are in this position, which is great for music enjoyment but it means that caution is required when cycling, for example. Once the earbuds are stable in my ears, they stay put regardless of head movement. Vocal messages. I have something similar with my Sony Walkman set and I love the audio confirmation of Power ON and OFF, Pairing, Out of Range and, especially, the Low Battery alert. With other brands, it is often just a visual light colour thing. The buttons' action, which is positive and reliable. When dealing with such tiny switches, it is important to feel a spring response and the difference between a long press and a short press is distinct enough to make these multiple functions easy to use. Since I don't own an Iphone or Smartphone, I did not test the telephone operation, so cannot comment on that. The supple wire connecting the two ear pieces, which makes them essentially independent, but is also short enough not to get tangled up in things or in my hair when I leave it untied. With my Sony Walkman, that is my main gripe. The original model was perfect but the second and third “improved” models are all wrong for me and, since the wire is stiff and too long for my head, it makes the ear pieces pop from my ears, which I find irritating. The sound quality. This is very good, comparable to more expensive brands, and I love to be able to hear layering and detail in my sound, rather than just loud noises. There is good balance between treble and bass, which is also unusual, with most earbuds rendering bass poorly. Connection range, which is above average for Bluetooth devices. The sound carries uninterrupted through a thick stone wall, only dropping once I move more than 10 metres (or 33 feet) away , which is the stated range for clear space. Fitting instructions are missing from the manual. There are pictures on the Amazon product page, but in general I think people are confused by the accessories and even which side the commands are on. On my set, the letter R (for Right) is printed almost invisibly on the side that has the MPOW (command) button. Most of the pictures show this correctly, but the photo of the couple bicycling has been reversed so that the command side appears to be in the guy's left ear. Anyway, this info should have been printed on the box, or in the manual itself. In conclusion, I am very happy with this headset. It works well, pairs easily with all the devices I have tried it with, battery life is good, fit is excellent and stays comfortable for long periods of wearing it, sound is above average to great, price is competitive, and it is a tiny thing to carry around. 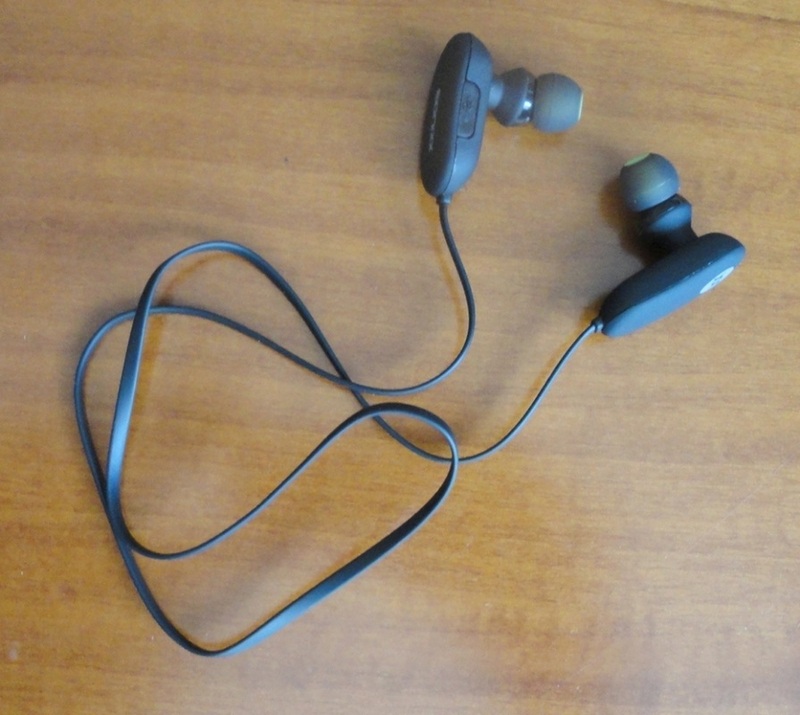 Since I've stopped heavy-duty gardening my use of earbuds has dwindled, but I still use them to cut the dullness of my exercise sessions, and any time I'm walking somewhere. I love the lightness and ease of simply slipping them on, as opposed to fitting bulky headphones over my head. Unfortunately my ears are difficult to fit, and most earbuds I've tried refuse to stay put, especially if I jump around. 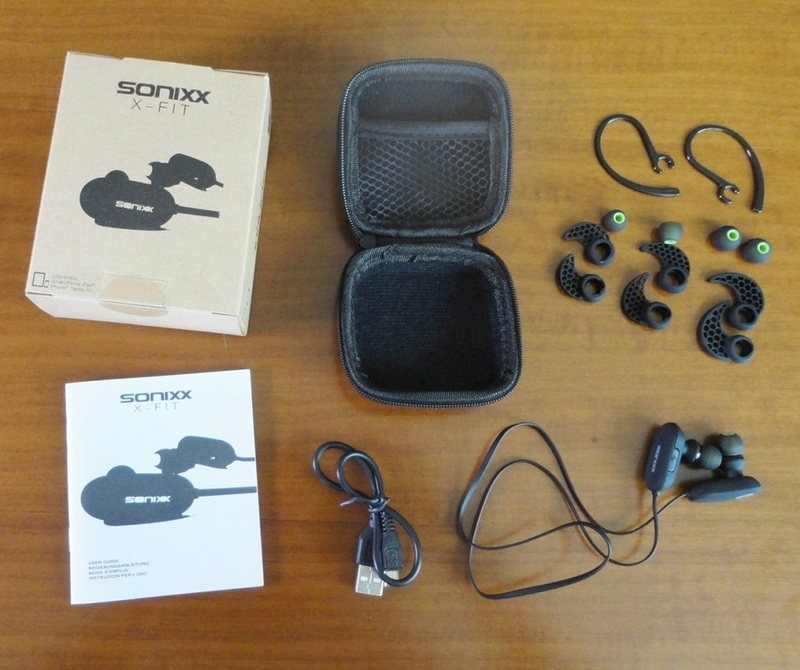 This Sonixx X-Fit headset seems to be the exception. I've put it on this afternoon as soon as the strimmer came out of our shed, and I must say it's doing a very good job of minimizing the snarling outside! As far as sound quality, I thought it was a tad sharp at first, but I'm getting used to it. I love the clarity and the volume is so loud I've had to turn it down a lot. I'm hearing layers and detail, but for me the bass is disappointing. I guess I prefer a rounder sound. The packaging deserves a mention. 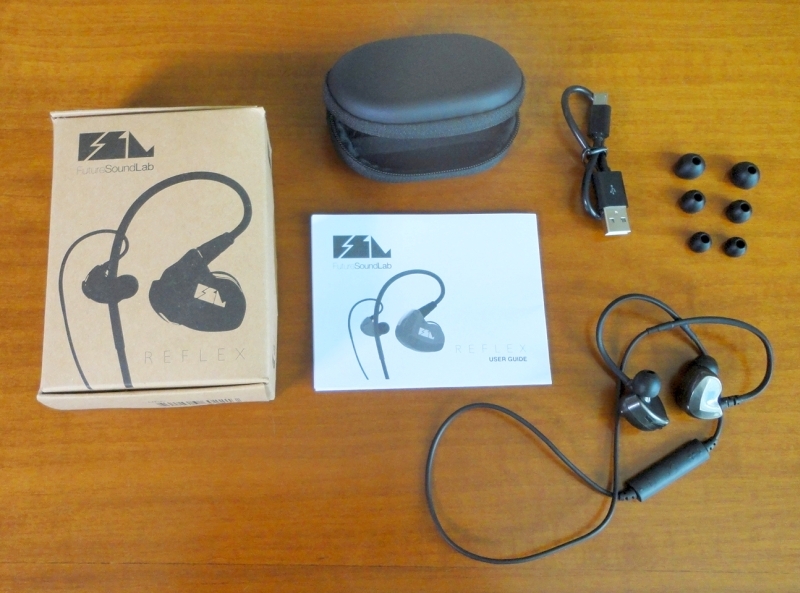 This headset comes complete with a very attractive hard protective case, tiny but big enough to house the headset, the charging USB wire, and a range of additional fitting accessories (3 sets of ear tips, 3 sets of stabilizer wings, and 2 ear clips). The manual is basic but understandable. When I was offered these sports earbuds to evaluate, I did not expect a lot, given the price. Having done a bit of testing, I really like them. I don't have a compatible phone to test the answering capabilities, but I do appreciate the voice indications of “Power Off”, “Connected” etc. I really like the supple wire connecting the two ear pieces, which makes them essentially independent, but is also short enough not to get tangled up in things or in my hair when I leave it untied. With some models, the wire is stiff and too long for my head, and it makes the ear pieces pop out, which I find highly irritating. I also like the sweat and water resistant design (the USB input is sealed by a rubber cap). So, my conclusion is that I am very happy with this headset. It works well, pairs easily with all the devices I have tried, it fits my ears and stays comfortable for long periods of wearing it, the sound is above average, the price (currently under £20 – US $25) is pretty low, the tiny case is easy to carry around, and the battery life (up to 8 hours) is extremely good.